Over the weekend, I explored the flagstaff area. There are 3 National Monuments that are in the Flagstaff area, as well as 2 others that are a little further away. 2 of the 3 Flagstaff National Monuments are located on the same loop road, and that is where I started out on Saturday morning. I drove to the farther of the 2 entrances onto the loop road and started exploring at Wupatki National Monument. The loop drive was definitely convenient, but also had some disadvantages when it came to exploring the park. Because I didn’t want to waste the time driving to the visitor’s center and then back out to the overlooks and then back past the visitor’s center, I decided to stop at the overlooks on the way to the visitor’s center. The trails and overlooks were pretty self-explanatory, but there were a few spots where a map or trail guide would have been useful. The main ruins at Wupatki were located just out the back of the visitor’s center, so I was able to use the trail guide at the main ruins. The ruins were pretty large, and in a lot of ways were similar to many of the other ruins I have been to in the area. However, the Wupatki ruins are sinagua ruins as opposed to ancestral pueblo ruins like many of the sites I had been to so far. There were definite differences in room sizes and uses compared to ancestral pueblo areas. It was neat to get to see how lots of the building materials and techniques were very similar, but the functions and arrangements were different to accommodate the different needs of the sinagua people. After Sunset Crater, I went to Walnut Canyon National Monument. Walnut Canyon is about 25 miles away from the loop the other 2 are on, but it is definitely worth the trip out. All three monuments can easily be done and enjoyed in one day. Walnut Canyon is a beautiful canyon that has sinagua cliff dwellings all along the walls of the canyon. There are 2 trails at Walnut Canyon: the rim trail and the island trail. The rim trail walks along (really not close at all) the rim of the Canyon for a short distance and has a few overlooks to see dwellings on the opposite wall. The island trail has 793 steps to climb along it and follows along a dense collection of dwellings on a feature in the canyon that appears to be an island. I did not want to kill my legs for day 2 of exploring, so I chose to just do the rim trail and museum. The rim trail has a few ruins along it, and provides beautiful views of the canyon. It was neat to get to see so many dwellings along the walls even if I did not explore them close up. The museum and video inside the visitor’s center really helped me to get an idea of what life would have been like for these people. When I finished Walnut Canyon, I still had a few hours left to explore. I decided to go for a walk in historic downtown Flagstaff. The architecture was really neat to look at, and there were murals and other art throughout the area that were really cool as well. Heritage Square is an open plaza in the city that was really neat to stop at. When I was there, they were setting up for a movie on the square and it was really neat to see the community feel. I wandered in to an art gallery and really just enjoyed getting to see the beauty and diversity of food and businesses in the city. I am really glad that I took the time to just walk the city and explore. On Saturday evening, I went back to Sunset Crater. They were having their monthly star party with a native storyteller speaking. The storyteller told us several stories about different animals and the stars. Storytelling in several native cultures is generally reserved for winter time because it is believed that telling stories of these animals in summer when they are more active and listening will cause you to come across them soon after the story is told. Because it wasn’t generally a storytelling season, it was really cool that the storyteller did still tell us several stories. She told us her people’s story of creation; she told us the story of how rattlesnake got his fangs; she told us the story of why coyote howls, and of how he got his tail. The stories were all cute and creative, and I really enjoyed getting to listen and learn. All of the Flagstaff national monuments (and Flagstaff itself) are considered to be dark sky locations, and so after the storytelling portion of the evening, there was an opportunity to look at the stars. For star parties, one of the local astronomy groups comes to the park and sets up telescopes for viewing. I got to see Saturn, an exploded star, and several different star types. It was really neat to get to see the planets, stars and constellations. The astronomers were also very helpful in interpreting what I was looking at through the telescope. It was really neat to learn so much and to get to see the sky so full of stars. On Sunday morning, I went to another Park Service program at Tuzigoot National Monument. The program was about scarlet macaws, and the group running it even brought a scarlet macaw along for the presentation. The macaw was a 7 year old named Sedona, and she was beautiful. Even though macaws aren’t native to the area, they do have a pretty extensive history in the area and remains of macaws have been found at many of the ruins sites in the area. It is still unclear if the macaws were used solely for trade, if they were used in sacrifices, or if their role was something else entirely. The presenter also talked about different conservation efforts with macaws going on today, and it was really neat to learn so much about the macaw’s history all the way through to today. 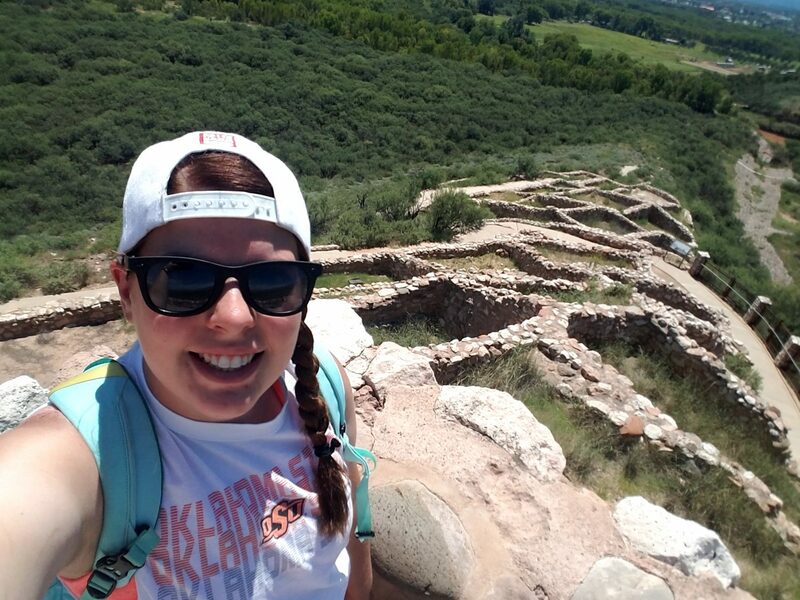 After the presentation, I went out and explored the Tuzigoot ruins. The ruins were a medium size community, with a tall central room that almost served as a tower. The view from the top of the whole community was beautiful, and the general landscape and view of the mountains around was also breathtaking. The trail around the ruins is only about 1/3 of a mile, so it didn’t take long to get through. The Tuzigoot ruins are sinagua ruins like the others from this weekend, but they did not have the same large storage rooms that the other sites had. Large pottery and storage vessels were still on display in the visitor’s center, so the people were still storing large quantities. Every room in the ruins also showed evidence of cooking, so it is thought that all rooms in the Tuzigoot ruins were multipurpose instead of having some dedicated for storage and some dedicated for living like some of the other ruins. Getting to Tuzigoot National Monument was also more challenging than expected. The roads were all fine getting there, but there weren’t any signs for the monument until like a mile before you get there. Most monuments it is easiest just to follow the road signs from the highway for the fastest route, but this is not possible for Tuzigoot. It was still easy enough to find with GPS, but the lack of signs did make GPS the only way to find it. I had been planning on going to the Montezuma sites and then exploring a little bit around Sedona, but there are a lot of things to do around Sedona and I wasn’t sure what all I wanted to do or what all I could fit in one afternoon. I asked one of the rangers at Tuzigoot, and he actually suggested Jerome State Park which was maybe 5 miles from Tuzigoot (still about 20 miles from Sedona). I decided to follow his suggestion that it was a cool place to check out, and I headed to Jerome. Jerome State Park is a sort of mansion that has been converted into a museum about the history of Jerome. Jerome was a major mining town until the 1930s-1940s, so a lot of the history is related to different aspects of mining. The Jerome mines were also a site in the union and labor fights, and it was really cool to see some of that history and the wage fights that went on. There were exhibits on the different minerals and stones that were found in the mines, and there was also displays on the history of the fire department in town. One of the rooms also had medical equipment and a small display on medical care during Jerome’s heyday in the 1920s-1930s. All of the exhibits and history were really neat, but I think my favorite part of the museum was the 3D maps of the mines. It was crazy to see how deep and how extensive the mines were below the city. Just outside of the state park, there is one of the old entry shafts into the mines. The access was covered by a clear platform so you could still see some of the depth of the shaft. The shaft was 1900 feet deep which was crazy to think about. Overall the Jerome park was fascinating, and I learned a lot about mining at the museum. On the way to Jerome, I had passed the Copper Art Museum which looked like an interesting place to stop. The museum is in the old high school building that was abandoned in the 1940s when the mines closed. It was really neat to see not just the copper, but also the old high school building. The classrooms were all labeled with the subject that used to be taught in the room and the current exhibit n that room. Everything in the museum had to do with copper, but a lot of it was really interesting to learn about. The first room had some history of copper in mythology and legend. I learned that copper is associated with Venus and females, while iron is associated with Mars and males. The second room had memorabilia from copper in military life from pirate canons to WWI and WWII. There was a room entirely dedicated to copper’s role in art, architecture and religion. There was also a display about the 4 different finishes that copper can have with examples of each of their applications. There were rooms about cooking and drinking, as well as a display on copper in electricity. One of the last rooms I went in had a bunch of glass in the middle which seemed very out of place in the copper museum, but each of the colors of colored glass is made using a different metal. Light blue is formed by using copper, and not just for glass making but for anything colored light blue. From printer ink to textile to glass, everything that has a light blue color originally came from copper. The museum also had a small display of memorabilia from when it used to be a high school which was really neat to see that they were preserving that bit of history as well. After the art museum, I made my way to the Montezuma sites. I started at the Montezuma well. The well is a mysterious continually filled natural well with dwellings along the sides. Vents along the bottom let water in to the well. Researchers have tried to send instruments into the vents to locate the original source of the water, but all of the instruments have been sent back out of the vents. The dwellings along the sides looked a lot like the dwellings at Walnut Canyon, but the overlook at the well was a lot closer to the dwellings than Walnut Canyon. There is also a short trail at the well that went right along the edge of the dwellings which was really cool. The second Montezuma site is the Montezuma Castle. The castle was really a large living community cliff dwelling. The trail to see the castle made the view even more impressive. There are trees along the path until right before the castle, so the first view of the castle is of all of it at the same time. The castle was also built in a really good location to be sheltered from the elements and erosion, so 95% of the walls are original. It was definitely one of the more impressive ruins that I have seen. The trail to see the castle was maybe ¼ mile long, and then there was a continuation that was another ¼ mile to see some of the other ruins in the canyon and the river. After Montezuma, I still wanted to explore some of Sedona. The drive in to Sedona was beautiful. I stopped a few times along the way to take pictures and look at the scenery. I also stopped at the Chapel of the Holy Cross. The gate to the chapel was closed by the time I got there, but even from just outside the gate, looking up at the chapel was gorgeous. As I was getting in to Sedona, the sky was starting to get cloudy, and there was a beautiful rainbow. I stopped and took a picture of the rainbow, but then it started pouring. I had been planning on exploring Sedona a little bit more, but because it was raining, I decided to just call it a day. Even without fully exploring Sedona, this weekend was full of sightseeing and adventure.